LivBar has super healthy snacks that you’ll love! Get fit this year with snacks that don’t come with guilt! Don’t know about you, but I’ve spent far too much time making excuses. Just one more cookie, m&m, or whatever I’ve got on hand is like a mantra sometimes. I don’t care becomes my excuse quite often as well. But sometimes I get on a kick and take care of myself for a while. It’s that time. I’ve gotten a taste of being able to fit into clothes that don’t need addition in the title and I liked it. A lot. Then came the excuses and I’m back. But I remember that taste enough o want it back! Trying out LivBar. It’s gotta be healthy as they are gluten, soy, dairy, corn, nut and GMO free! 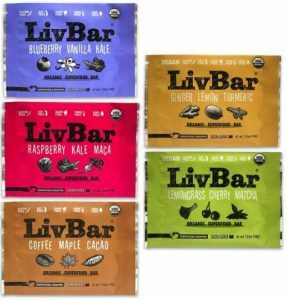 LivBar was created as an answer to what protein bars were the best, both healthy and flavorful. Gabe and Jan Johansen are Nutrition and Fitness consultants who created LivBar. While my immediate reaction wasn’t a total love for the texture and flavor, I feel like once I get use to the texture I’ll enjoy them a lot more! Definitely packed with flavor! They’ve definitely given me a healthier alternative to my past bad habits! My favorite, of course, is the Coffee Maple Cacao! First off, a huge shout out and thank you to Savings in Seconds for hosting this fantastic hop! Good luck to everyone! In this hop, you’ll find lots of prizes that would be perfect to stash away for a rainy gift-giving day. Enter all the giveaways below! Please note: Savings in Seconds and participating bloggers are not responsible for sponsors who don’t deliver prizes. One Lucky Winner will receive a variety pack! ← Dating Safety: Protect Yourself When You Go Out! LivBar’s are healthy organic snacks which will give you energy-awesome!